Next EPC Meeting: June 14, 2012, Metropolitan Counties Emergency Services Building. Details here and available using the link in the right side bar. March 8, 2012 EPC Meeting Power Points and the like - will be available using the appropriate links in the right side bar starting on Monday (I'm in the Philippines right now - and currently, Internet stuff like upload technology, is not my friend). Recorded Power Points from EPC meetings: Now available for the first time. Links to them will also be available on Monday in the right side bar. If there wasn't proof enough before that I'm a crazy man - that will no longer be the case. I'm still fiddling around trying to get some bugs out of the Minnesota DNR Aerial presentation from the March meeting, but other than that, all presentations given at the December 2011 and March 2012 meetings will be available. While no one will be winning an Academy Award for video quality, the recordings should be good enough to satisfy the needs of those who couldn't make the meetings. This approach is also part of the decision to stop broadcasting EPC meetings through the HSIN Connect system. Apparent use of that product wasn't high enough to justify the continued effort. Publication Schedule for This Blog: This site has a solid and growing readership that is greatly appreciated. To the degree folks are reading and thinking about the ways the revolution in geospatial and related technologies can benefit the Emergency Services Sector, the better off we will all be. To that end, there are now over 340 posts on this blog that relate some facet of that story. With that level of volume now available, I've made the decision to cut back publication to Monday through Friday. That's not to say there isn't some part of the story that needs to be told during the weekend, but rather that close tracking of weekend readership indicated there were only a handful of folks paying a visit when the distractions of the weekend were calling. I'm a big believer in reinforcing strength, so that's where the effort and time will be devoted going forward - Monday through Friday readers. U.S. National Grid Tidbit: Rumor mill indicates Wisconsin is getting ready to plunk down over $100,000 to begin USNG implementation efforts in the state. Twin Cities GECCo: After Action Report/Improvement Plan is in second redraft and is expected to be officially released by the end of April. Readers of this blog will be some of the first to get their hands on it. 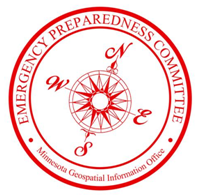 Dan Ross, long time member of the EPC and strong advocate for bringing together the geospatial and Emergency Services Sector communities is Minnesota's new Geospatial Information Officer. This is a fabulous development and I look forward to working with Dan and all MnGeo staff as the EPC marches into its 10th year in existence. Well, all for this EPC Update. Hope you have a wonderful Easter weekend with friends and family! P.S. Yesterday, the United States Coast Guard sent the Japan Tsunami "ghost ship" to bottom of the Pacific. Click here.